While the commercial world tiptoes toward the notion of a self-driving car, the military is charging forward with efforts to make autonomy a defining characteristic of the battlefield. Guided by artificial intelligence, the next-generation combat vehicle now in development will have a range of autonomous capabilities. 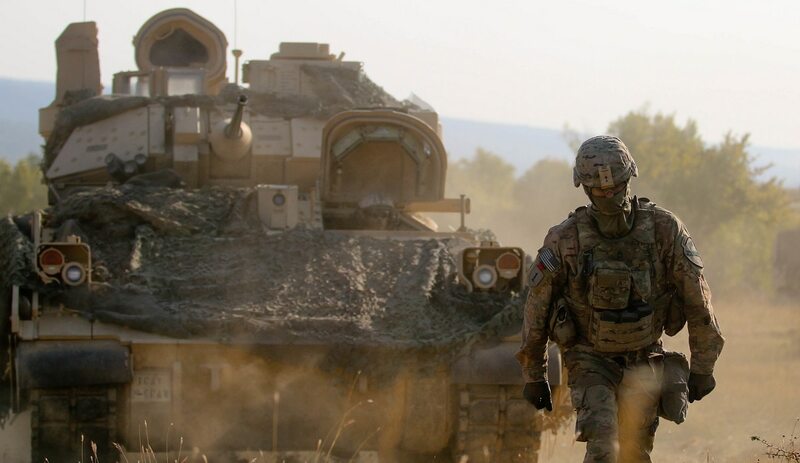 Researchers at Army’s Communications-Electronics Research, Development and Engineering Center (CERDEC) foresee these capabilities as a driving force in future combat. Slated to come online in 2026, the next-gen combat vehicle won’t be entirely self-driving. Rather, it will likely include a combination of autonomous and human-operated systems. To realize this vision, though, researchers will have to overcome a number of technical hurdles. An autonomous system would need to have reliable access to an information network in order to receive commands and relay intel to human operators. CERDEC’s present work includes an effort to ensure such connections. “We need resilient comms in really radical environments — urban, desert, trees and forests. All those require new and different types of signal technologies and communications protocols,” David said. Developers also are thinking about the navigation. How would autonomous vehicles find their way in a combat environment in which adversaries could deny or degrade GPS signals? Get a bi-weekly update on the challenges and opportunities surrounding the use of drones. “Our role in this is to provide assured localization,” said Dr. Adam Schofield, integration systems branch chief for the positioning, navigation and timing (PNT) division. In order for autonomous systems to navigate successfully, they’ve got to know where they are. If they rely solely on GPS, and that signal gets compromised, “that can severely degrade the mission and the operational effectiveness,” he said. CERDEC, therefore, is developing ways to ensure that autonomous systems can find their way, using LIDAR, visual cues and a range of other detection mechanisms to supplement GPS. “We want to use all the sensors that are on there to support PNT,” Schofield said. In one scenario, for example, the combat vehicle might turn to an unmanned air asset for ISR data in order to keep itself oriented. “As that UAV goes ahead, maybe it can get a better position fix in support of that autonomous vehicle,” he said. Even as researchers work out the details around comms and navigation, they also are looking to advances in artificial intelligence, or AI, to further empower autonomy. AI will likely be a critical component in any self-directed combat vehicle. While such vehicles will ultimately be under human control, they will also have some capacity to make decisions on their own, with AI as the software engine driving those decisions. AI can help systems to reach that level of certainty, but there’s still work to be done on this front. While the basics of machine learning are well-understood, the technology still requires further adaptation in order to fulfill a military-specific mission, the CERDEC experts said. Despite such technical hurdles, the CERDEC team expressed confidence that autonomy will in fact be a central feature of tomorrow’s ISR capability. They say the aim is create autonomous systems that can generate tactical information in support of war-fighter needs.